The attorney of Andrea Jimenez, the Doral teacher accused of lewd conduct with her 13-year-old student, believe police did not do a thorough enough investigation before arresting her. NBC 6 anchor Johnny Archer reports. A teacher at a Doral school is facing multiple charges after police say she professed her love for and tried to kiss a 13-year-old student. Andrea Jimenez, 47, surrendered to police Friday to face charges including lewd and lascivious conduct on a child and attempted lewd and lascivious conduct on a child, Doral Police officials said. Jimenez is a teacher at Doral International Math & Science Academy, officials said. Police said they began an investigation into Jimenez on Wednesday, which revealed she had become attracted to the boy. Starting in May, Jimenez sent the boy text messages that "explicitly professed her love for him and her desire to engage with him in an intimate manner," police said in a statement. An arrest report said Jimenez, a science teacher at the school, became aggressively romantic in an obsessive tone" in messages sent to the boy through Snapchat and Instagram. Andrea Jimenez, 47, surrendered to police Friday to face charges including lewd and lascivious conduct on a child and attempted lewd and lascivious conduct on a child, Doral Police officials said. "I will go to hell for u. Die for u stop eating to feed you," one message read, according to the report. "My love for u is so real and huge!!! I don't mind facing the devil himself for u." Jimenez told the boy not to speak with other girls his age and routinely bought him clothes, shoes, electronics, toys and books, the report said. Investigators also learned Jimenez had grabbed the boy's face and tried to kiss him back in June, before the end of the previous school year when he was 12, officials said. Jimenez was held in jail on $17,500 bond, records showed. 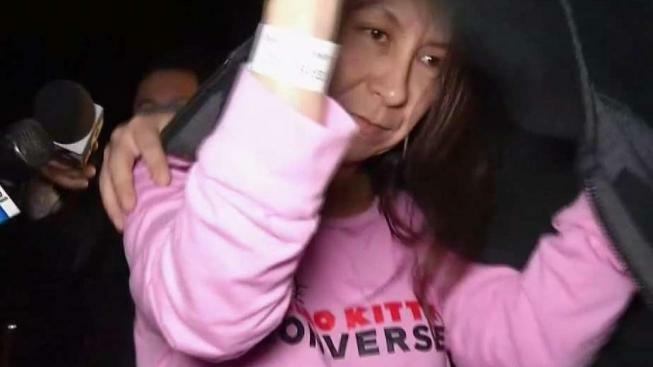 She bonded out Friday night and avoided reporters' questions as she walked out of Turner Guilford Knight Correctional Center. Her attorney told NBC 6 he believes police did not do a thorough investigation before arresting her and that she will be vindicated after all the facts are presented. "I think it is reckless, with charges this serious, both for a victim and for somebody being accused of a crime to be rushed to judgment, that's not fair on any side," Jude Faccidomo said. A spokesman for the school said Jimenez has been fired. The spokesman added there have been no previous reports of inappropriate relationships between Jimenez and other students. "As this is an ongoing investigation, school administrators will continue to work closely with authorities. The school’s top priority is the privacy, safety, and security of students and families," the school said in a statement. "The School has committed additional personnel to support students who may have questions or need to share concerns regarding these matters." The NBC 6 Investigators found that more than 40 teachers in Broward and Miami-Dade counties have been disciplined or arrested due to incidents related to sexual misconduct in the past two years. More on that investigation here.